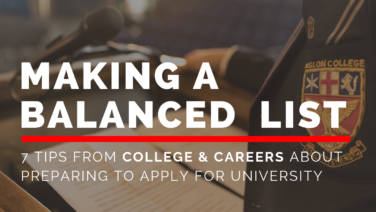 How do you create a balanced list when applying to universities? Aiglon's Director of College & Career Counselling, Mrs Patience Fanella-Koch, shares important tips on what students should consider when thinking about and creating their university application lists. Matching students to a fitting university is a challenging, but rewarding part of the application process, and the College & Careers Counselling Department is here to help. Over the course of one's time at Aiglon, we work with students to match academic performance and personal strengths with university and course-specific requirements and expectations. How do you make the most of your list? (1) Allow time for self-discovery. (2) Don't be afraid to explore. Perform detailed online research, read around various subject areas, visit multiple different campuses. (3) Be engaged all year. Participate in activities during the school year and summer break that reinforce personal interests or career ideas. While keeping those three points in mind, the process of building a university list must be a thoughtful one. Students should consider universities where they are likely to be admitted and happy! Ultimately, the right “fit” between a student and university is when one discovers an appropriate academic and social match; this is very personal and very different for each student. The highly qualified College Counselling staff at Aiglon help guide this process. What questions should you consider? (1) Where would I like to spend the next three or four years of my life? In what country? Studying in what language? Do I prefer an urban, suburban or rural location? 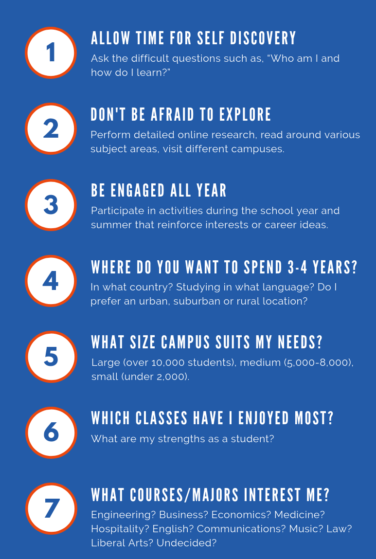 (2) What size campus will suit my needs? Large (over 10,000 students), medium (5,000-8,000), small (under 2,000). (3) Which classes at Aiglon have I enjoyed the most? What are my strengths as a student? (4) What courses/majors interest me? Crafting an appropriate and balanced list takes time and careful thought. If you keep these ideas and key questions at the front of your mind, the process should be an important journey of self-discovery. The end goal is a destination that works for you as a person. Don't forget; we are here to help. Patience is Director of the College & Careers Counselling Department at Aiglon College. She leads a four-person team, working to offer dedicated support and personalised guidance to students as they search for the best match for their undergraduate studies and further career goals. Patience brings nearly 20 years of experience in the admission and college counselling world and serves as an executive board member of the International Association for College Admissions Counselling (IACAC).